Commodore stepped out in 1984 when it bought a little company with a revolutionary personal computer. 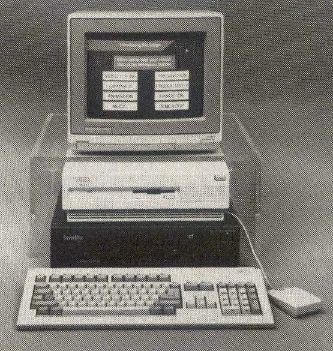 It saw in this machine a price/performance potential offered by no other PC and successfully brought it to market in 1985. The Amiga has since made interesting inroads in video production, but it has really stayed alive thanks to the enthusiasm of evangelists and a couple of zingers like DeluxePaint and DigiView—splendid products but not quite strong enough to push the Amiga ahead. Commodore just made another innovative move, this time in software. AmigaVision, which has been two years in the making, may well do for the Amiga what desktop publishing did for Apple's Macintosh—put it on the map. AmigaVision is an authoring system. It's designed to help people with no programming experience put together interactive audiovisual presentations, the component parts of which have been produced with other tools. It helps you put together things like touchscreen information systems, corporate business presentations, educational reports, quizzes and documentaries, and even animated Christmas cards with MIDI-produced background music. It does this by combining data stored on floppy and hard disks, videocasettes, and videodiscs. This technique is called multimedia (the industry's latest buzzword) and involves melding components from various sources into a single presentation. You'll need paint and animation programs, digitizers, and music composition and word processing software in order to create those presentations. You can also include prerecorded sounds and images from videodiscs, videocasettes, and MIDI synthesizers. AmigaVision helps mold these elements into a unified presentation by tying them together; organizing their sequence, flow, and timing; and adding mouse-selectable hit boxes so that users of your presentation can control it interactively. AmigaVision presentations can also accept input from the keyboard. AmigaVision helps you do all this with surprising ease. In general, after you've created your components and decided how you want to present them, you select appropriate AmigaVision icons by dragging them from a box at the bottom of the screen to a large, scrollable grid above. It's on this grid that you arrange the icons in logical groups (called parent and child), tying them to your components with specific parameters entered through requesters and pull-down menus. You must know what you want to do and which icons do what, but AmigaVision comes with one of the best manuals I've ever seen and two tutorial disks. Commodore's point-of-sale system uses AmigaVision and a videodisc player to show off the Amiga to potential buyers. I made an interactive presentation incorporating things I found lying around my house and hard drive. I used AmigaVision on my A2000 with 3MB of RAM, the new SuperAgnus, WorkBench 2.0, a VCR and genlock, and a MIDI music synthesizer. My presentation consisted of three primary parts: a home video of the kids, a database of text-based articles and screen shots, and a slide show with background music. I superimposed stationary and animated captions over the video with flashy color fonts. AmigaVision will put ANIM5-format animations (but not ANIM brushes) over video and will synchronize internally produced sound effects as well. I made a database to call up articles and reviews I've written, displaying the text with screen shots. I had planned on using a variety of fonts for the text, but that became tedious, as special codes for both fonts and screen format must be inserted into the text by hand. You can move up or down through the text by a line or screen at a time, but AmigaVision won't automatically scroll your text. Then I fashioned a slide show that included digitized photographs of the kids in HAM overscan. I moved between the pictures using several of the great wipes and fades available in AmigaVision. I added SMUS background music using sampled 8SVX-format instruments. When I turned to add MIDI, I foudn that AmigaVision plays a MIDI-connected synthesizer by sending a SMUS score out the serial port, which works but isn't entirely satisfactory. And it plays only four voices at once—MIDI or internal but not both. Shortcommins such as these could be overcome by launching external programs, such as the Sonix music player, through Amiga Vision's CLI or ARexx interfaces. I made my presentation interactive through use of a main screen (made with DPaint) of images representing each section. Using AmigaVision, I easily made hit boxes out of these irregular-shaped images so that the corresponding section would be activated when the mouse was clicked anywhere on it. I also made my sections available on a pull-down menu. I had little trouble making my presentation perform the way I had envisioned it. The problems I encountered were sins of omission—things AmigaVision cannot do. My AmigaVision wish list includes a freestanding runtime module so others can enjoy presentations without owning AmigaVision, ANIM brush support, smooth-scrolling text, a compatible WYSIWYG word processor for fonts and text formatting, true MIDI support, and joystick support. These wishes may come true. Commodore is working on AmigaVision 2.0 now. It should be available in 1991, and I'm told that the company is considering adding these features and more. Even as it stands, the variety of media AmigaVision can incorporate and its extraordinary ease of use make it truly innovative. By comparison, HyperCard on the Macintosh seems clumsy. AmigaVision has more features than Deluxe Video III or CanDo, and after using it, I find using UltraCard and The Director downright painful. By its very nature, the multitasking Amiga is the perfect platform for multimedia, and AmigaVision is the easiest-to-use authoring system I've seen for any personal computer.